There we were, sitting beside each other. Phil and I.
I’m talking about Phil Collins. But I just call him Phil now. Because I sat beside him for about one minute. As you can tell this is leading to one of celebrities’ worse curses: people who don’t know them writing about them. But, of course, this is different. Because I know him. Because I sat beside him for about one minute. And he politely introduced himself to me and shook my hand. That, and we have several things in common. When Phil Collins was a kid growing up in a London suburb, he would often watch an amazing show on his family television. There, in black and white, was Fess Parker as Davy Crockett, King of the Wild Frontier. As he matured, Collins not only acted out the exploits of his new hero, but he often refought the Battle of the Alamo with his toy soldiers. While I’ve never sure been it’s psychologically healthy to adopt Texans’ fascination with the battle they lost, playing Alamo seems a better alternative than the Davy** Crockett chapter that influenced me as a child in Virginia Beach. I sat alone in my room, playing the record. Over and over and over. It wasn’t this one, or, if it was, it was part of a much longer recording. I can’t find the version in my mind online. Perhaps what I remember didn’t exist except as a compilation in my jumbled file cabinet of a mind. But it was Davy Crockett. Or Fess Parker. And it was a life and death struggle with bears and Indians… and the part that haunted me. I have no idea how many times I listened to that recording, but definitely many times too many. Even I knew my mother was exasperated. I would wet my bed. We’re not talking about a three-year old. I was six. I ran screaming to my parents one night about the bears in the house – my visiting Great Aunt Mary snoring. There were Indians in my closet. I finally learned keeping the light on in the closet kept them at bay. But the light filtering through the louvered door did not help with the Crockett family’s other adversaries. The women then slacked the rope a little and made it fast round a hickory stump, when my oldest darter took the tongs and jumped on [the alligator’s] back, when she beat up the “devil’s tattoo” on it, and gave his hide a real “rub a dub.”…My wife threw a bucket of scalding suds down his throat, which made him thrash round as though he was sent for. She then cut his throat with a big butcher knife. He measured thirty seven feet in length. (Davy Crockett’s almanack,*** of wild sports in the West, life in the backwoods, & sketches of Texas. 1837, p. 10). My self-preservation instinct was strong. Who in their right mind would risk getting out of bed with alligators on the prowl? Alligators hungry for a “tongariferous” fight. Bladder be damned if I would. Not only would I not set foot on the floor when alone in my room at night, I would not let a pinky slip over the edge because…. Snap! Those alligators were fast. And I had a family to protect – a toucan whose name now escapes me; George the green monkey whose rubbery pink hands and feet were comforting to chew nervously upon when trying to make it through dangers lurking in the night; and Nipper, a huge RCA dog who took up easily half of my single bed. I never once let George’s tail hang over the edge. I would sleep rigidly, never ever tumping one over the edge into the alligator pit. To dream of an alligator, unless you kill it, is unfavorable to all persons connected with the dream. The flaw, of course, was no one understood this was why I wet the bed. And, when I finally managed to explain, no one took the danger seriously. Of course, now they have books about this. But that was the late ’50s, and they had not yet been written. Finally, midway through first grade, a solution was found. A path of folding chairs was set up each night between my bed and the bathroom. Somehow, I was able to summon the courage to imperil myself by crawling across this wobbly bridge to the safety of the bathroom, and, of course, everyone knows alligators would never cross the threshold onto the tile floor. So, as I was writing, Phil’s interest in perpetually fighting – probably trying to change the outcome – the losing battle at the Alamo seems a preferable Davy chapter in which to be stuck. And Davy seems to have stuck with both of us, Alamobsessive souls that we are. I focus on and fret about the Alamo as the city’s front door. I constantly nag, in blog form, the city to enforce its historic ordinance to keep illegal signs from multiplying at night. I have even used some of the historic postcards I have assembled to create protest collages. These efforts have had limited effect. And, not surprisingly, these particular collages have not resonated well with art collectors. Now, legislation has been filed to form a commission to study the state of Alamo Plaza. Good news to some, but the bill would go farther than my Alamobsession wants by giving the commission the mission to “reclaim its original footprint.” I might not love Ripley’s, but I love the Alfred Giles’ Crockett Block. Plus, if returning Alamo Plaza to its appearance at the time of the battle is taken literally, the Alamo would get a crewcut (Click here for a long-winded post about that particular issue). I don’t know how Phil feels about this. Because how much ground can you cover in one minute? From Bill Wyman’s metal detecting to Alex James’s cheese-making, every self-respecting musician is obliged to cultivate a hobby to relieve the stresses of the rock star life. 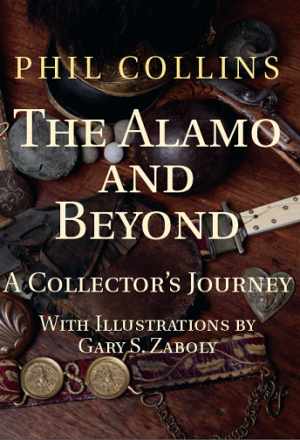 Collins is no exception, utilizing the basement of his Swiss home for his twin enthusiasms: building model railways and tending to his vast collection of Alamo memorabilia. “… it’s an all-consuming thing for me. I spend as much time in San Antonio as I can. I rent a little property out there on the walls of The Alamo itself where I’ll dig for artifacts. I’m always looking for stuff to buy and the collection is growing fast. I’ve got a huge number of cannonballs, muskets and bowie knives that were used there, Lady Crockett’s pouch and many documents that were written by the main protagonists. One of my prized possessions is a receipt signed by Commander William B. Travis for 32 head of cattle used to feed the Alamo defenders. Phil collected so many Alamo things that photos and information about them now fill a 400-page book, which brings us to another thing we have in common. We are both authors, which is how we met. Our books – his, The Alamo and Beyond: A Collector’s Journey, and mine, Last Farm Standing on Buttermilk Hill: Voelcker Roots Run Deep in Hardberger Park – both were honored with awards presented by the San Antonio Conservation Society at a luncheon on Friday. Yes, there were eight other publications about Texas history recognized, but those authors need to write their own blogs. Because this one is about Phil and me. Because I sat beside him for about one minute. And, as you can see, we obviously engaged in animated conversation. Probably because we have so much in common. And I didn’t even get a chance to tell him I’m married to a bluesman. Somehow, KSAT-TV failed to catch this important connection on camera, which is good because I would not have wanted to end up in the pages of some publication, such as The Star, where they zoom in on the superficial shortcomings of someone my age – the preponderance of wrinkles, protruding bellies and falling bustlines. Another thing Phil and I share is we have changed careers. I have changed career directions several times and feel free to sprint off in any direction I choose. If I choose to write books, that’s fine. No one objects; no one cares. His less prolific work rate is partly down to health reasons. Since 2000 he has suffered from loss of hearing in his right ear. More recently he was diagnosed with severe nerve damage to his hands, making drumming extremely challenging. During recording sessions for his new album, he was forced to tape his sticks to his hands. Owsers. That sounds totally painful. Give this man a well-deserved break. Keen to accentuate the positive, he explains that his medical concerns have forced him to take stock of his life. “I never used to think of myself as a workaholic,” he says. “I used to work non-stop because I couldn’t believe my luck that I was able to do all these things that I loved. I was everywhere and I can see why that must have been annoying to some people. Then I reached a point where I no longer felt the need to go zooming around the world and attend the opening of every envelope. Basically I stopped. Besides, somehow I feel this man’s Alamobsession will end up helping shape the future of Alamo Plaza. I’m sure it will accomplish more than my haranguing collages and blog posts. Oh, and, Phil, if you get tired of staying in hotels when you visit San Antonio, the Mister and I might be able to work out a house swap with you. The Alamo’s less than a mile away from our door. Call me next time you are in town and you’ve got a minute. Who knows what else we might have in common? *With apologies to William C. Davis, author of Three Roads to the Alamo: The Lives and Fortunes of David Crockett, James Bowie, and William Barret Travis. Hey, at least I didn’t title the post My Life with Phil Collins. Now that would have been a stretch. ** David would be more historically correct, but does not represent the popular culture upon which we – Phil and I – were weaned. ***Oh, dear. I had to stop in the middle of this post to order a copy of Davy Crockett’s Riproarious Shemales and Sentimental Sisters: Women’s Tall Tales from the Crockett Almanacs, 1835-1856, for which I paid a penny, plus $3.99 shipping – quite a bargain unless the alligators return ‘neath my bed. And, as that is an “our” bed, I’m positive the Mister would not relish the thought. Update on March 25, 2013: John Spong of Texas Monthly spent considerably longer than a minute with Phil Collins. A follower reminded me to look back for this photo of Phil Collins, coonskin-hatted at age five playing Davy, that appeared alongside an article by Steve Bennett in the San Antonio Express-News last May. Which reminded me of another obvious thing Phil and I have in common – the Battle of San Jacinto. His collection began with a receipt for a saddle purchased by John W. Smith, who was at both the Battle of the Alamo and the Battle of San Jacinto and seems to continue to haunt the collector a bit. My desk currently is haunted by reams of paper pertaining to the families and relatives of John Coker who settled on his land grant on the north side of San Antonio. Jack Coker was a hero of San Jacinto credited with the idea of blowing up Vince’s Bridge, blocking one of the possible escape routes for the Mexican troops. And, on another note, one of my sisters fessed up that she was the one who told me I’d be safe from dangers lurking in my room if I let no part of me slip over the edge of the mattress. So nice after all these years to finally unload the psychological burden for bedwetting on a sibling. Update on May 6, 2013: Mary Dearen’s version of the same awards luncheon as published on mywesttexas.com. Update on June 24, 2014: Phil Collins is donating his entire collection of Alamobsessive artifacts to the Alamo.